Aristo model B22 cold light head for installation on Omega B22 enlargers. On the B22, the lamp head is installed in the condenser lens housing, and the original lamp cap is removed so that the power cords can be routed out the top of the lamphouse. 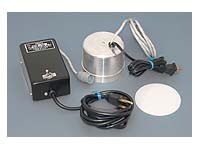 Includes power supply and lamp head with opal diffusion disc. This cold light head is used and has minor cosmetic marks, but is certified to be in perfect working condition. We provide a 6-month warranty, exclusive of the lamp. This unit is supplied with 40W W45 type lamp, recommended for printing on graded B&W papers.